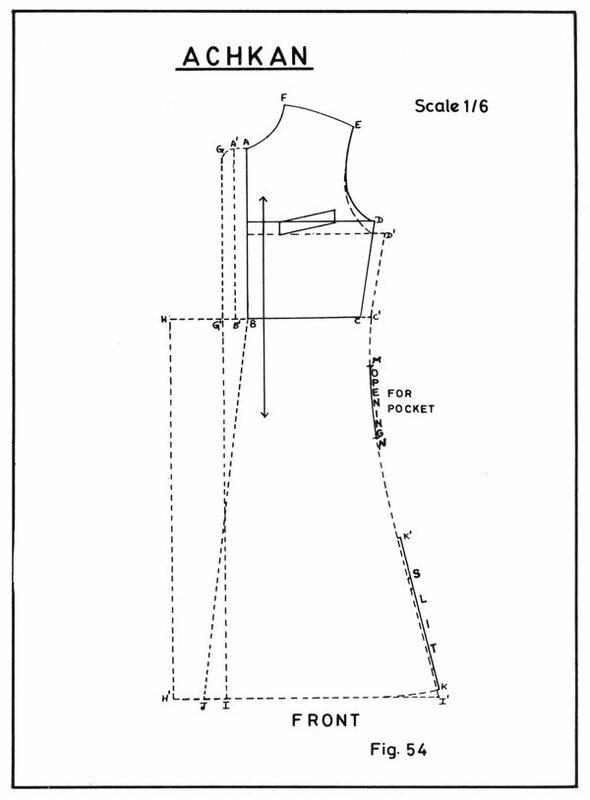 History of costume is engaged in an adventure of vast absorbing dimensions. 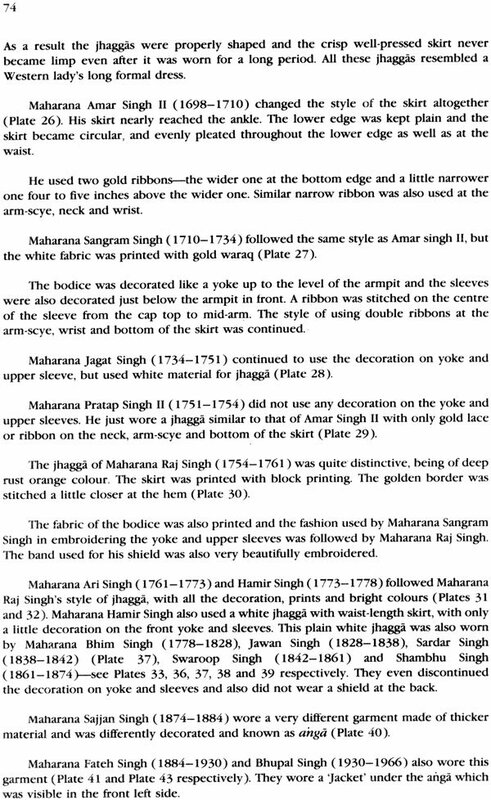 For the first time a dedicated unique collection of exquisite and profusely elaborated costumes of rulers of Mewar has been prepared. 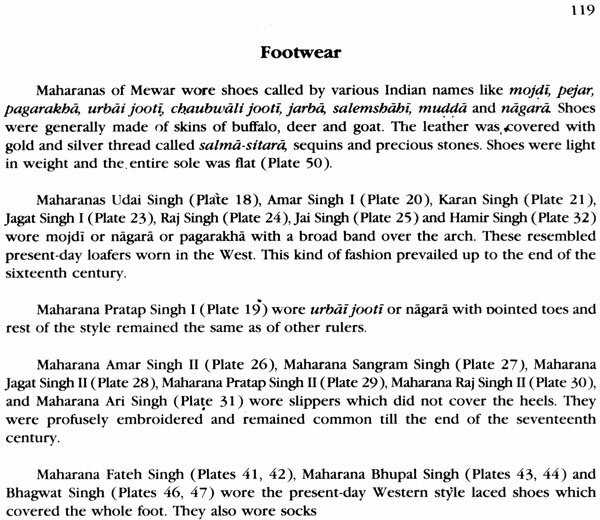 The author has made a conscientious effort to present a guideline for the construction of garments, textiles used, jewellery and footwear worn with the costumes. 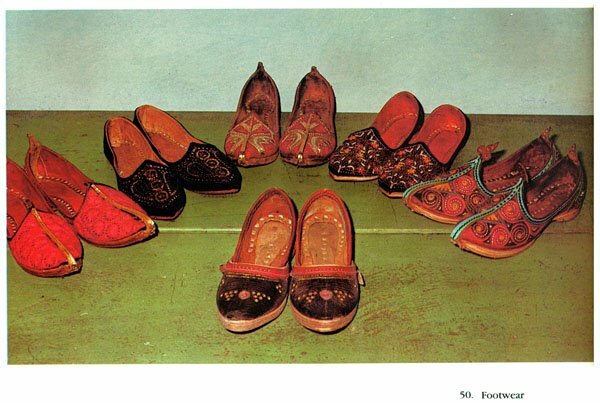 The coloured photographs and diagrams explain all the time-honoured traditions of the past and present. 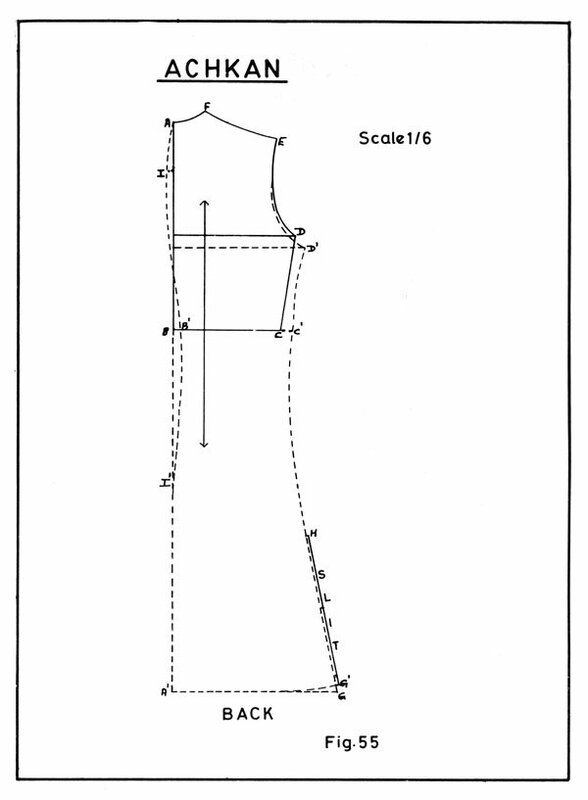 The book will be immensely useful to apparel designers, merchants, theatre people, students, historians, artists as well as to the fashion houses in Europe and America which are always in search of exotic styles of dresses for their clients. 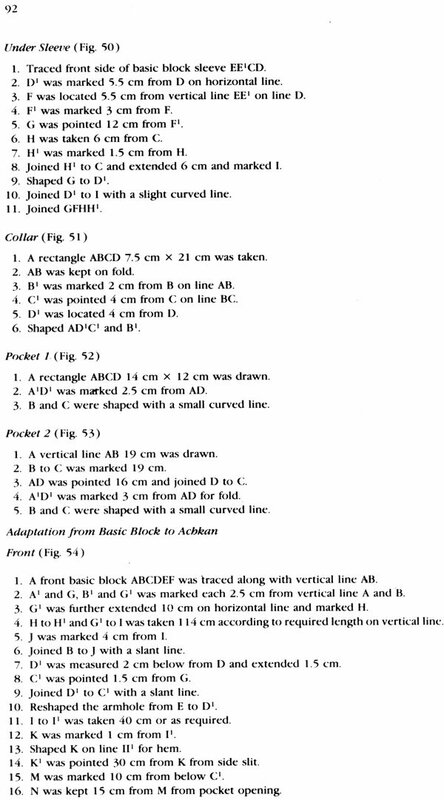 Dr. P. Mathur (b. 1946) is Assistant Professor and Incharge of the Department of Clothing and Textiles at Sukhadia University, Baroda under the able guidance of late Dr. J. A. Singh, Dean, Professor and Head, Department of Clothing and Textiles, Faculty of Home Science, M. S. University, Baroda. For past fifteen years Dr. Mathur has been teaching various courses on crafts, clothing construction, textiles, costumes, etc., to the under-graduates and post-graduate students. She is recipient of various honours and awards for research studies. She is member of various associations and has published a number of articles in leading professional journals and magazines. MEWAR is a land of forts, in which some of the heroic dramas of Indian history were enacted. Each fort tells the story of Rajput valour, patriotism and chivalry. Chittorgarh is one such fort with many heroic tales. 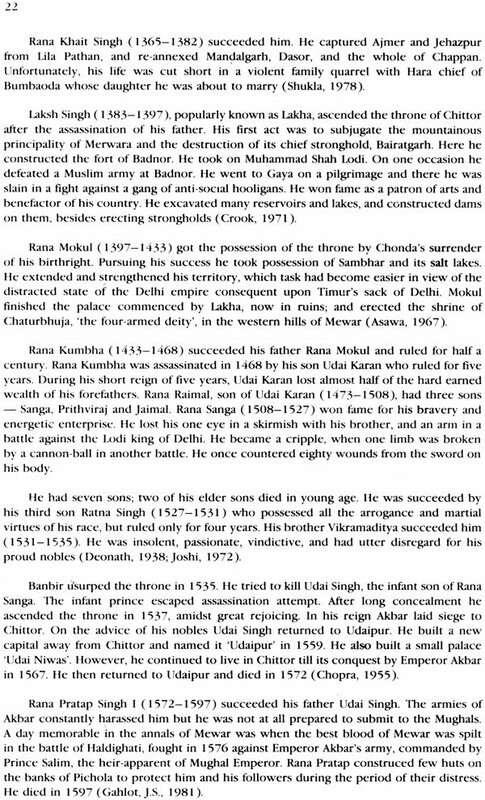 History tells us how the Rajputs, dressed in saffron robes, embraced death as if it were their bride. Not to be left behind in the competition for bravery, the women followed them. Maharani Padmini and ladies of the fort boldly leapt into the consuming fire to preserve their honour. To them death by jauhar was better than the security and luxury of inglorious captivity. 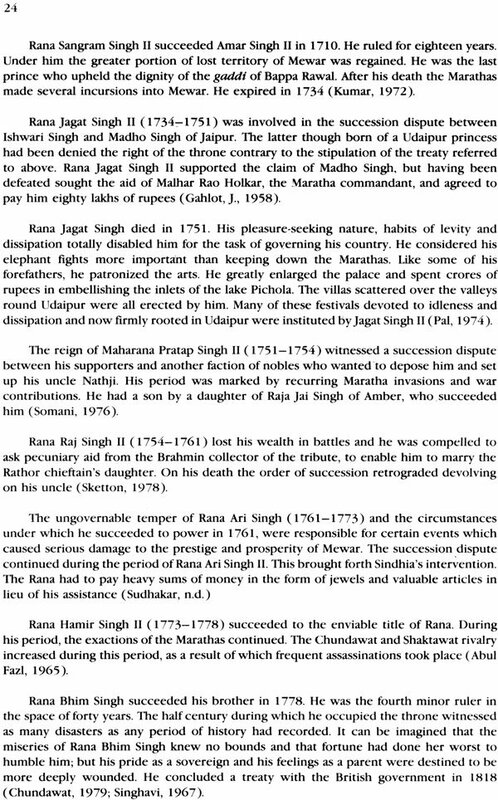 The brave deeds of the Rajputs have few parallels in the annals of history. The Rajputs make the finest soldiers, keeping up the proud traditions of Rana Sanga and Maharana Pratap Singh of Mewar (Khandpur, 1971). The Aravalli hills provided a natural frontier to Mewar in the north, west and south and made the country inaccessible from three sides. The long lines of the mountains and the wide dense forest isolated the people of the State from the movements taking place in other part of India. The idyllic beauty of its valleys and rugged terrain of its mountainous regions influenced the tastes, minds and the way of life of the rulers and the people of Mewar. The rivers and streams extended from the principal river Chambal and its tributaries Banas, Berach, Kothari, Wakal and Khari which enabled the people to construct artificial lakes such as the Dhebar or Jai Samand, Raj Samand, Udai Sagar, Pichola and Fatech Sagar (Singh, T. 1971). The irrigation facilities contributed to the extensive prosperity of the State. Many times the State had to depend on the rains for agriculture and other allied occupations. A drought was seen after three or four years and famine was the biggest natural calamity. Sometimes floods due to heavy rains caused great destruction in the State. The climate of Mewar was generally healthy and the heat was never so great as in the states of the north-west. 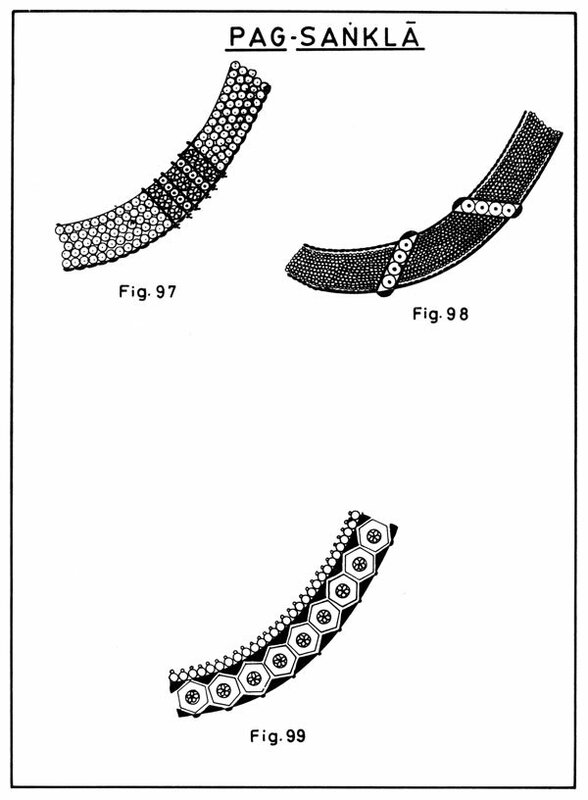 Rich and most important minerals were zinc, iron, mica, sandstone and marble. Skilful artisans made swords, daggers, ivory and wooden bangles. A variety of embroidered cloth and fabrics printed with gold and silver leaf and handicrafts of sandalwood were produced. The boundaries of Mewar extended to Ajmer, Merwara in the north; Jodhpur, Sirohi in the west; Dungarpur, Banswara and Pratapgarh in the south; and Jawad, Nimach, Nimkher Pargana and Bundi-Kota district in the east (Erskine, 1908). With the repeated external invasions of the Turks, the Mughals and the Marathas, the boundaries of Mewar had shrunk into a secluded territory. 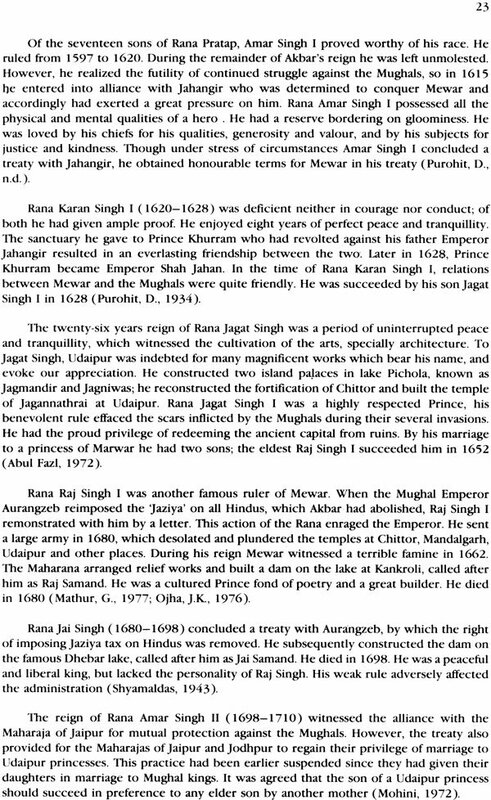 After Akbar, the Mughal Emperor, defeated the ruler of Chittor, Rana Udai Singh shifted the capital of Mewar to Udaipur in A.D. 1559 and changed the name of the State from Mewar to Udaipur (Agarwal, B.D., 1979). In Sanskrit inscriptions, Medpat is the name used for Mewar which became known as Udaipur State after the founding of the city of Udaipur in 1559. Medpat reminds the historians of a period when the territory was ruled by the people called Meds or Mers, who were descendants of the Sakas. Medpat was also known as Pragvata; the Karanbal inscription of Jayasimha Kalachuri refers to the Mewar kings Hamspala and Vairisimha as rulers of Pragvata (Ojha, G.H., 1927,1931). 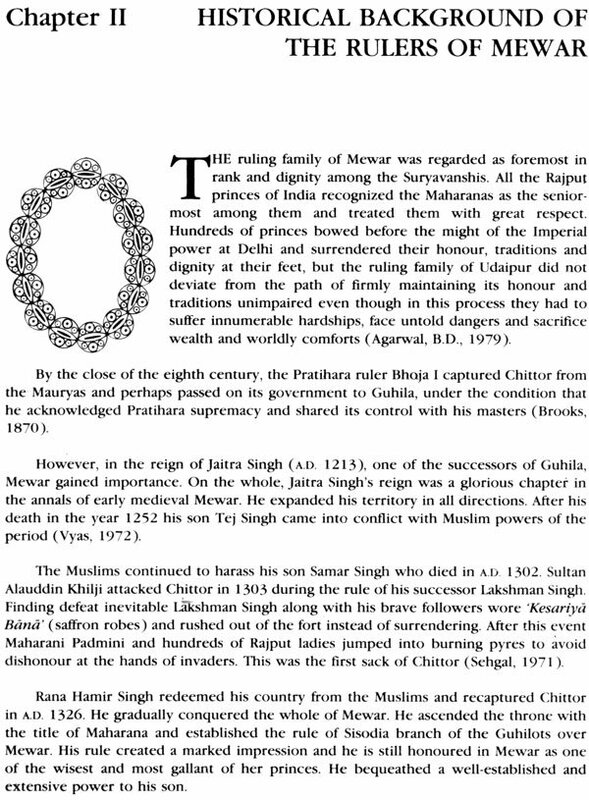 The rulers of Mewar belonged to the older branch of the Suryavanshis or "children of the Sun" or the 'Solar Race'. The Maharana was regarded as the legitimate heir of the throne of Rama and was styled as 'Hindua Suraj' or the 'Sun of Hindus' (Tod, 1920). 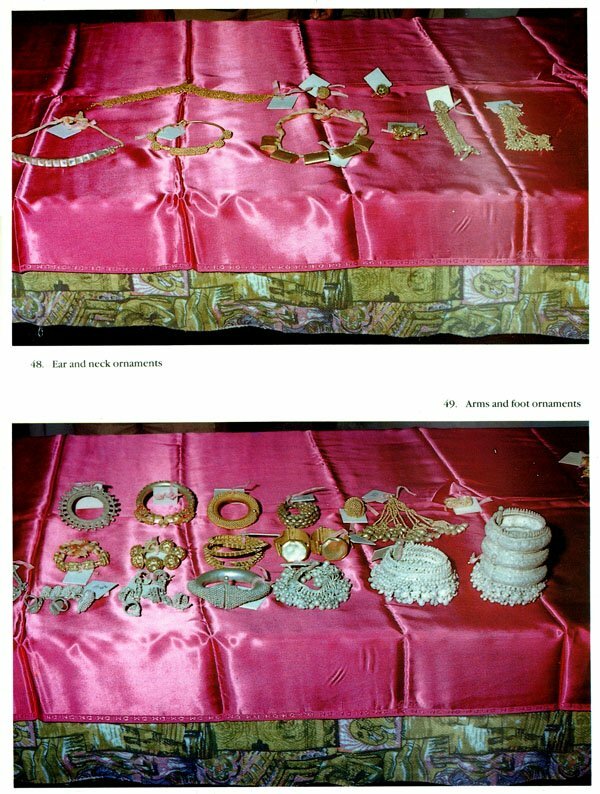 They lived elegantly and wore elaborate costumes and jewellery; however, the information available on the clothing during the early periods is negligible. Whatever is obtained is by studying the sculptures and paintings of the period. Although Mewar was the most important centre of early Rajasthan painting the 'Golden Age' of Mewar art was the middle of the seventeenth century in the reign of Jagat Singh (1628-1652). Several illustrated copies of the Bhagvata Purana; written and illustrated at Chittor in 1651, and. the splendid Ragmala set now kept in the National Museum of India, New Delhi, are some of the finest works of the period (Moti Chandra, 1957). The illustrations in the former portray incidents mainly from the life of Lord Krishna and his frolics with the gopis (milkmaids), the hero and the heroine theme of contemporary Hindi poetry, and the latter is pictorial representation of Indian musical modes. The illustrations from the Bhagavata Purana and the Ramayana are conceived and executed on a wider canvas and the hundreds of figures overcrowding the scenes play their roles against the background of the social life of the times. Scenes from rural life, marriage ceremonies, processions, dance and music parties, and life of the palace are convincingly and feelingly depicted (Manaria, 1974). The popularity of the art in the eighteenth century is obvious from the tremendous output of the Mewar school, but it is now rapidly losing its charms and aesthetic merit. Although the old themes were not neglected other popular subjects like portraits of rulers and courtiers; realistic studies of horses, elephants, dogs; and court, harem and hunting scenes, were executed in large numbers. Works repainted from the same paintings give valuable information specially when very little written material is available on them. 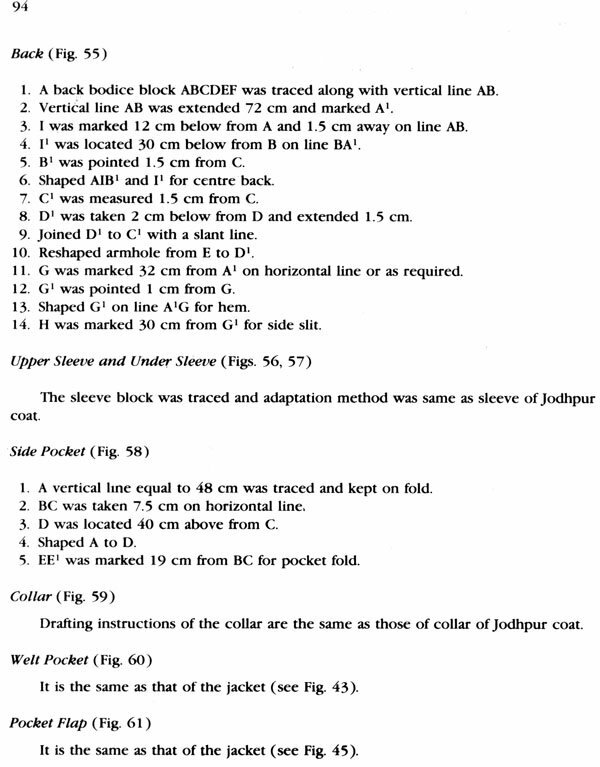 Existing texts and pictorial records have important gaps to be filled, because the original evidence on the costume itself is not available inasmuch as a great number of surviving garments date from the last century only and even these are scattered (Tod, 1920). From the very early childhood this author had the opportunity of observing all the processions on different occasions, when the rulers paraded in the streets of the city and the people who worked in the palace joined them. It was also her privilege to observe the costumes of her grandparents and uncles who worked in the palace and wore dresses of different colours, prints and styles on the occasion of various festivals and ceremonies. 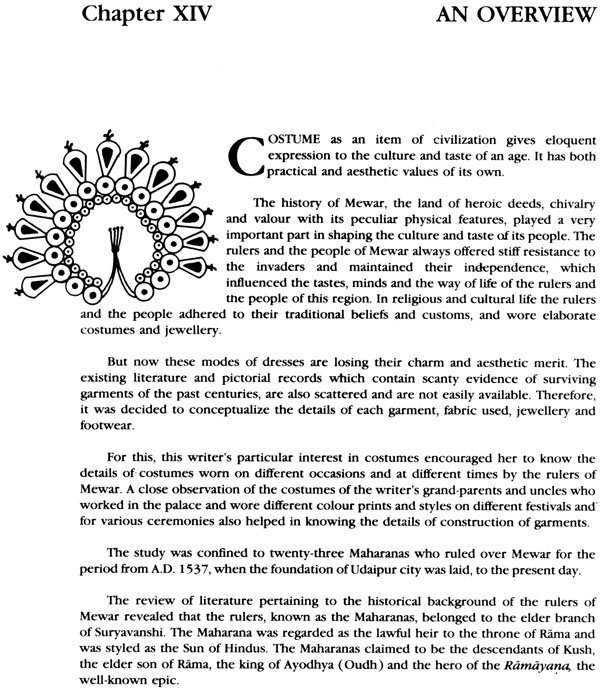 Therefore, this author decided to conceptualize the details of each garment, fabric used for wearing apparel, jewellery and footwear. 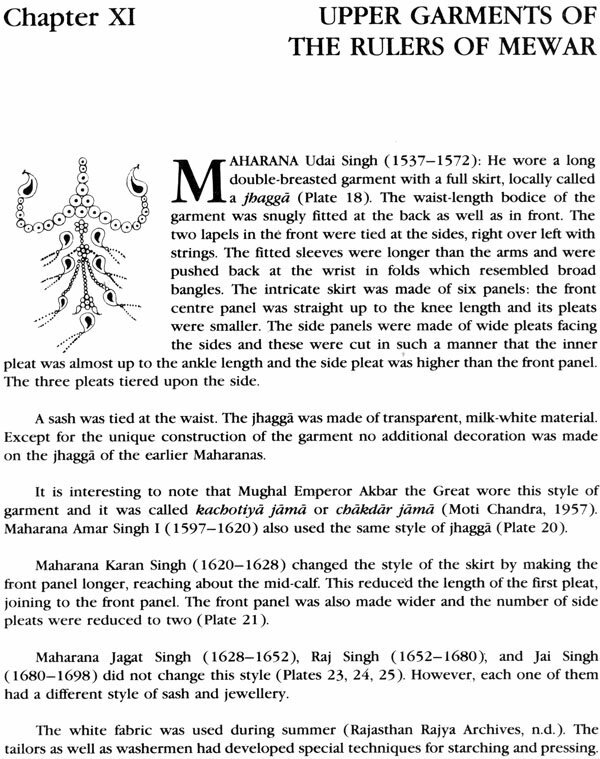 For this study the author has studied the costumes of twenty-three rulers who ruled over Udaipur city from 1537, when its foundation was laid, to the present day.